To determine what will become of your vehicle in a Chapter 7 bankruptcy you must first determine the amount of equity in your car. For these purposes equity is defined as the value of a particular item, in this case your vehicle, after you subtract the amount owed on the item, such as your auto loan balance owed. If you own your car outright, your equity is the value of your vehicle. If you have loan out on the vehicle, your equity is the difference between the balance still owed on the vehicle and the actual value of the vehicle. Unfortunately, after doing this type of calculation, many debtors find that they have negative equity in their vehicle, meaning they owe more than the vehicle is worth. For example, we had a client who owed approximately $12,000 on a vehicle that was worth $4,000. Thus leaving this particular client with $8,000 in negative equity. If the figures had been reversed and the vehicle was actually worth $12,000 and the amount owed was only $4,000 then the client would have had $8,000 in positive equity. Positive equity is commonly referred to simply as equity. While having negative equity in your vehicle may not generally be a good position for most people to be in, those who are facing a bankruptcy can actually benefit from this situation. When you owe more on your vehicle than what it is worth, you have the option of redemption. Redeeming your vehicle means paying the lender the current fair market value of the vehicle as opposed to the balance of the loan secured against the vehicle. If you choose to redeem your vehicle you must pay the lender the vehicle’s fair market value. This is typically required in a single lump sum payment. The fair market value can either be agreed upon by the parties or determined by the court. Check out Part II of this blog post to learn how to pay for the redemption of your vehicle or Part III of this blog post to learn about the other options for your vehicle in bankruptcy. 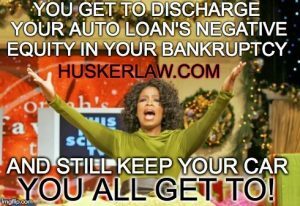 Or, just contact our office today so we can discuss your unique situation for your free initial consultation to learn if bankruptcy will help you get the fresh start you deserve.